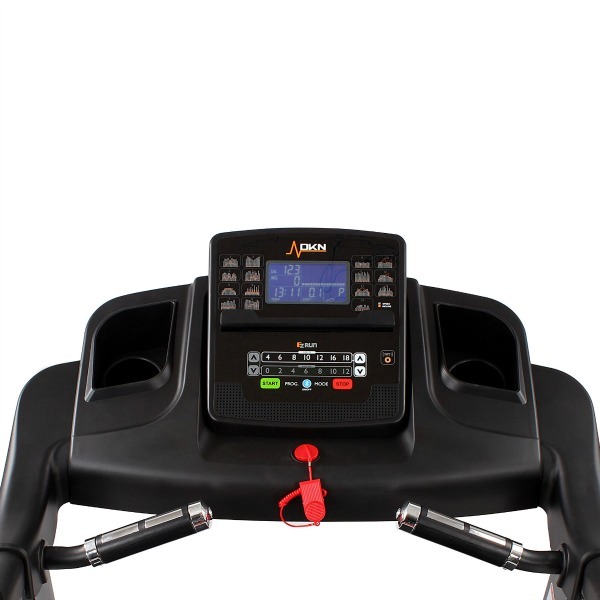 DKN EzRun Treadmill Review & Best Deal! 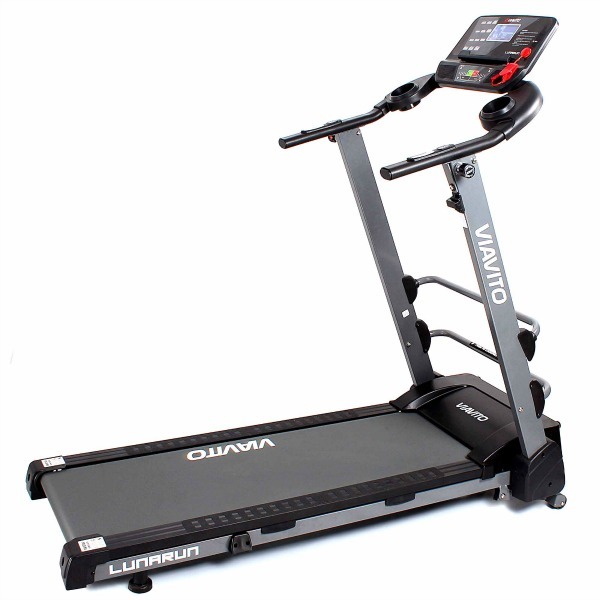 Known for premium quality machines, DKN treadmills rarely disappoint. So, when we heard about a new model being launched, we were naturally quite excited and couldn’t wait to get our hands it. We knew this was a serious treadmill as soon as we took delivery of our test unit. The box weighs nearly 100kg! So, naturally, we figured that we’d be spending the next couple of hours assembling it and this was the first pleasant surprise: the machine is 95% pre-built in the box. Assembly just involves cutting the 4 corners of the box to flatten it out, lifting the uprights into place and securing with a few bolts and then twisting the console into place and securing it. Our one criticism of the assembly process was that tightening the bolts to secure the console to the uprights as access is a little on the tight side. But – what a refreshing change to assemble a treadmill without needing to mess around with cables and electronics and worrying about doing it wrong – just a few bolts and that’s it. Once assembled, DKN’s intentions with this machine becomes very clear: create a real running machine for those on a tight budget that simply doesn’t compromise! We spent a few moments admiring the look of the looks of this treadmill – it manages to look both industrial grade and stylish. Before we received our test unit (whilst reviewing the specifications), one concern we had was the motor size being 1.75 horsepower and this being smaller than machines from other brands with similar sized decks. However, as soon as we powered up the machine, it became apparent that this was a none issue. Having inspected the actual motor, it’s interesting to note that the motor is bigger and clearly more powerful than many motors we’ve seen being advertised at 2-2.5 horsepower from other brands. Technical specification issues aside and onto the most important factor: How good is the EzRun as a running machine? With a full sized deck, there is plenty of room to let runners concentrate on their run and look forward, rather than constantly needing to look down to see if they’re positioned on the deck in a safe place. The motor moves the belt with ease all the way up to the top speed of 20 kph (over 12 mph) which is more than enough for the fastest sprints. The deck is nicely cushioned and does provide a softer surface in comparison to pounding the road, but not so soft as to have a noticeable trampoline effect that many that use a treadmill for training for an outdoor run would find offputting. In short, the EzRun is simply superb to run on. 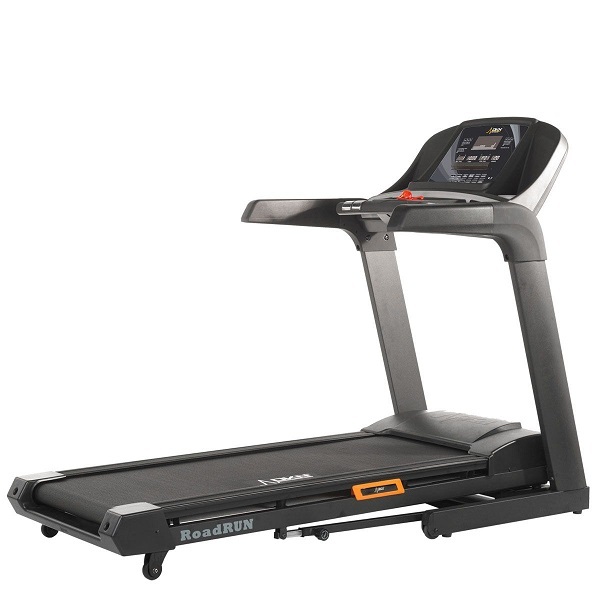 Not only this, the EzRun is easily one of the most stable treadmills we’ve tried to date – it’s simply rock solid! Another bug bear of ours and a source of great confusion is treadmill inclines. 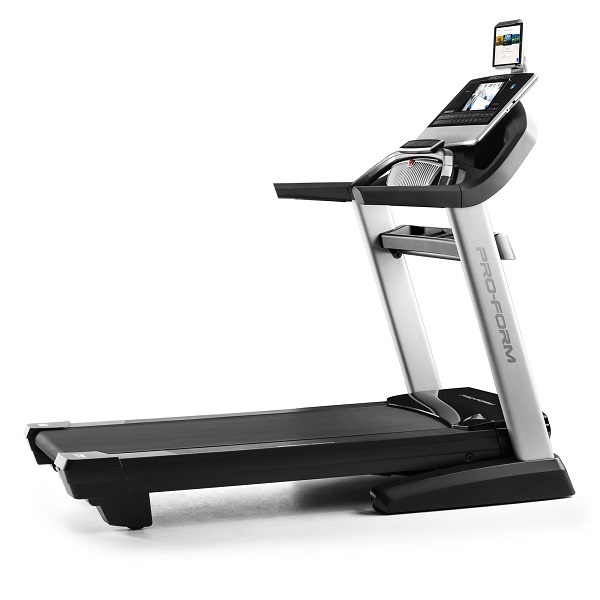 Many treadmills are advertised as having ‘levels’ of incline (including other machines in the DKN range), rather than specifying the gradient as a percentage. With the EzRun, there is no messing around: it’s 12 levels and 12% maximum incline. 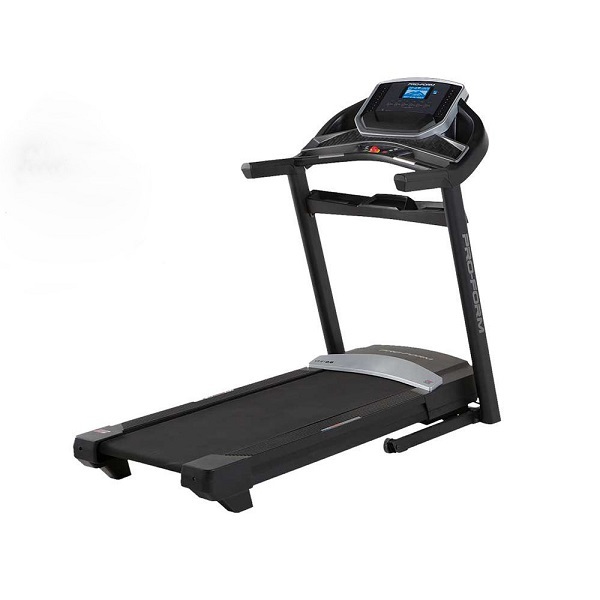 This makes it quite a versatile machine: incline levels this high are particularly well suited for those whose primary goal is weight loss – walking and jogging at a high incline is a great way to burn calories without putting too much strain on the joints. In terms of controls and the console, the EzRun is up there in terms of features with much more expensive machines. At the centre, there is a 5-inch blue back-lit LCD display which provides all the essential feedback. There there are speed and incline quick keys to enable easy manual control of the machine. So for those that just want to use a treadmill with a minimum of fuss and configuration, it’s a simple case of hitting the start button on the console, waiting for the countdown before the belt starts moving and then either using the quick keys to set a target speed / incline or the adjustment keys on the handlebars to make small adjustments. However, for those that really wish to explore the console, an absolute delight awaits them. There are user profiles that enable two different users to enter their age, gender, weight and height to get more relevant and personalised workout feedback (such as calories). There are 15 pre-set programmes which have been designed by a personal trainer and are actually quite useful. For ultimate flexibility, there are two user-defined programmes as well as heart rate controlled ones. Speaking of heart rate, like most premium treadmills, the EzRun has a built-in Polar compatible wireless heart rate receiver. Whilst the machine does have pulse grip sensors, these aren’t particularly useful as grabbing these whilst running isn’t practical and no grip based sensors manage to provide consistently accurate feedback. So, with the receiver built-in, you can use an optional chest strap transmitter to get ECG accurate heart rate feedback. Finally, there is a tablet holder and a little Bluetooth button. 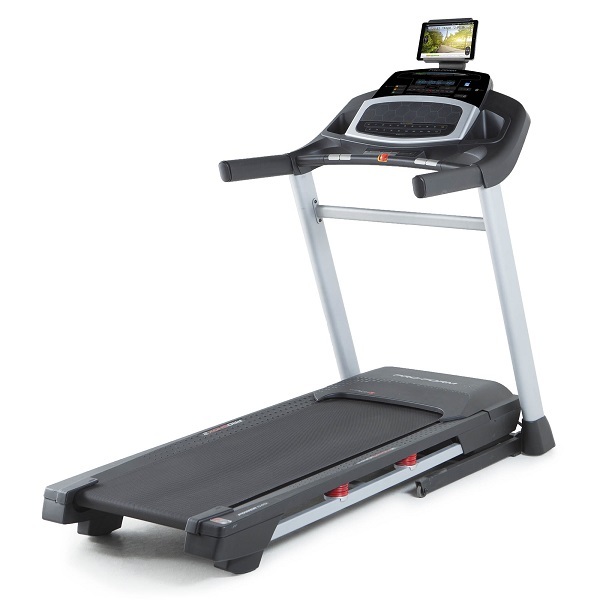 When this is pressed (the treadmill must be in standby mode), it activates the Bluetooth chip in the console and allows the treadmill to be paired with a compatible phone or tablet. The tablet holder can hold a phone or a tablet and there are a few apps that are compatible with DKN machines such as Kinomap which provides rolling videos and controls the incline of the machine to match the gradient of the terrain in the footage. In terms of other extras, there are are speakers built-in. Please never mix up a treadmill with a high fidelity audio system, but they function as well as you’d expect of any small speakers! The folding mechanism is pretty standard with a hydraulic cylinder providing making the deck feel lighter and providing a soft drop facility. Being a substantial machine, EzRun isn’t a machine that should be moved around frequently. It does have transport wheels and to move it, you fold the deck and put your foot against a cross beam in the base of the frame and tilt the treadmill onto two wheels. In the unlikely event of anything going wrong, DKN’s treadmills all benefit from a comprehensive 2-year on-site warranty. 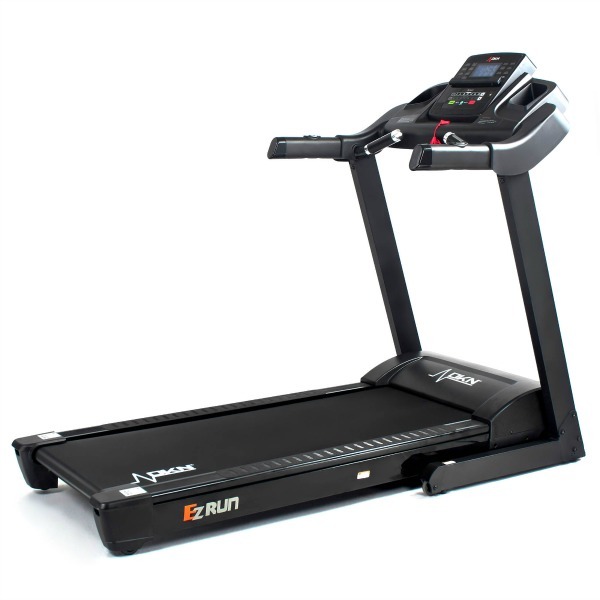 The EzRun is a high spec, full size, full function running machine that’s both stylish and superbly stable at a price that blows most of its direct competition out of the water. It’s hard to communicate just how nice it is to run on. We’d normally expect this kind of robustness in something far pricier which, along with all the other elements, makes this one of our favourite models that we’ve tested recently. 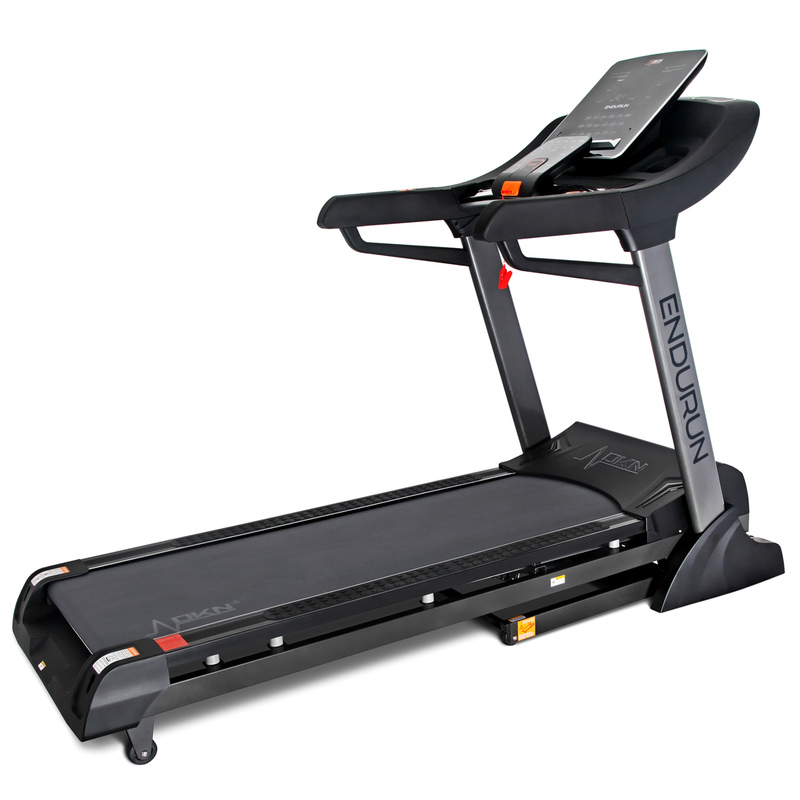 To get the DKN EzRun treadmill for only £659.00, enter voucher code EASTER on the DKN UK basket page!